A few months ago, I was feeling very much like I was in a rut. I had a lot of goals and dreams, but I felt clueless how to go about achieving anything of any importance. I've always set goals and made it a point to slowly chip away at them, but I needed something more concrete for every area of my life. As I was thinking on how to do this, I just decided to sit down with a spiral bound notebook and write down everything I wanted to do. 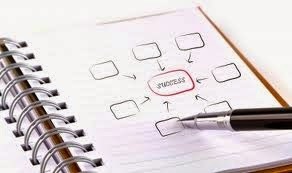 What is a success notebook? It's a dedicated notebook for all things success in your life. My success notebook will be different than yours because what is success to me will mean something different than what success means to you. To set up your success notebook, I recommend sitting down with a spiral-bound notebook, a pen, and a cup of something nice. Be sure to choose a quiet and calm time to complete your notebook - kids should be asleep or out of the house and you should make it a point to be in a calm, focused and positive state of mind. No negativity is allowed when setting up your notebook. The sky is the limit here and confidence is key. Once you determine which categories are relevant and important to you, write those down on the first page. You can add on to this list later; my list of categories doesn't take up half the page. On the next page, write down the first category name at the top of the page. Contemplate what being successful in that category means to you. I can't stress that enough - do not compare yourself to others. Do not think about what your friend is doing in this area of her or his life. Do not consider what your mother would call successful. This notebook is a reflection of you and only you. Depending on your own situation, you may want to chat with your partner and children about what success looks like in certain categories. I did not speak with Jason regarding my success notebook but I absolutely considered what he would call a successful wife and integrated those characteristics in that particular category. For each category, write down what success is for you in that category. How do you use this notebook to actually achieve something? Check out part 2 of this series next week when I reveal how to put your success actions and attitudes into action.